Infrared saunas are an effective tool for natural healing and prevention. Infrared light has the ability to penetrate human tissue which in turn produces a host of anti-aging health benefits. In a recent study from Harvard Health, sauna use was linked to longer life with fewer occurrences of fatal heart problems. All of the amazing clinical benefits aside, frequent sauna use makes you look and feel great, and people love the experience we’ve built around the practice. Recent studies have correlated frequent sauna use (3+ times a week) with a significant reductions to the risk of heart disease (70%+) and Alzheimer’s / dementia (65%), and to reduce all cause mortality rates by nearly 40%. Frequent sauna use is clinically shown to reduce blood pressure, lower pain levels, and improve circulation. Our Infrared sauna helps to stimulate the production of collagen and improves skin quality through creating pore-cleansing sweating. Infrared saunas are designed to operate at a lower, more comfortable temperature than typical fitness center saunas, allowing you more time for a more productive detox. 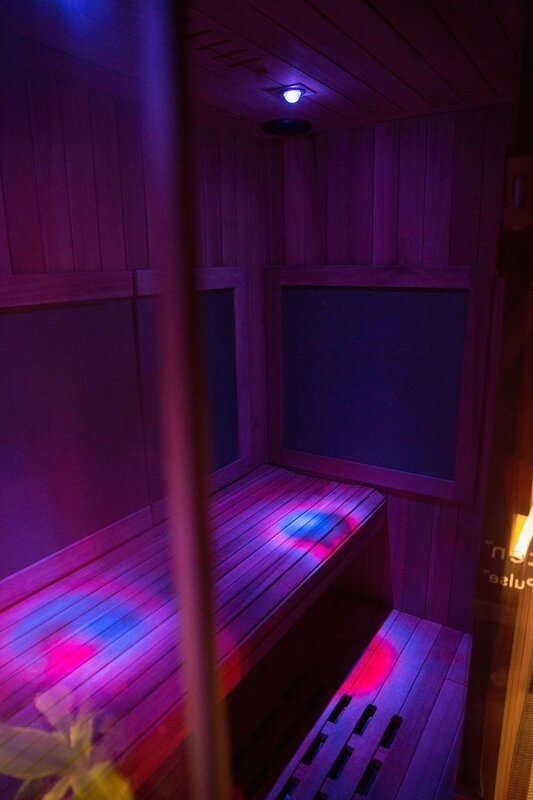 The infrared sauna has been shown to stimulate the blood flow. It heats up your muscles with infrared rays that allows an increase in blood flow. This is similar to the benefits of a passive cardiovascular workout. Another benefit of improved circulation is quick muscle recovery. The increased of circulation also reduces inflammation, decreases pain and speeds healing.